Animal Nutrition — Munro Agromart Ltd. In an effort to reaffirm our commitment to the local livestock producers, Munro Agromart Ltd. carries the brand Masterfeeds to supply our livestock farmers. For 75 years, Masterfeeds has provided its customers with quality people, products and programs backed by one of the finest research facilities in the world. Partnering with that valuable experience, we at Munro Agromart Ltd. feel that our local producers will benefit from our combined resources. Delivering bulk feed at Kenmatten Dairy. 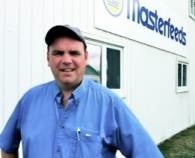 In order to properly service our customer base, Jamie Smith, ruminant specialists for Masterfeeds, is available to provide the feed and environmental management service needed to maximize your herd’s performance.Jamie has roots in Glengarry, as some of you may remember Jamie's father, Glen, who was Glengarry's Ag Rep during the 80's and 90's. Jamie is a 1990 graduate of Kemptville College's Livestock program and has been balancing dairy and beef rations for 20 years. We will be stocking a full line of dairy and horse products and are able to bring in other items on short notice. Feed, both bags and bulk, will be manufactured at Prescott, only a short drive up the 401. We look forward to the opportunity of providing you with quality feed products and service.